Ha Long Bay on a cloudy day. First, get ready to go. I wrote about everything you will need in an earlier blog post. Make sure your visa is set and ready to go. The next thing you need to be aware of is the craziness of walking around. Lots of people walk, but tons of people drive scooters and little motorcycles around. A good rule of thumb was given to us by a coworker: Just go forward at a steady speed and don't stop. Once you walk into the road, the vehicles begin to change their route based on where you are. If you alter your route, you have a bigger risk of being struck by a driver. Another good rule came from the welcome packet given to us by the Sea Star Resort in Phu Quoc. Basically, it said that roads in Vietnam run by a simple rule: The biggest thing has the right-of-way. Therefore, a large truck has the most power, then a car, motorcycle, bicyclist, and pedestrian. It is jarring at first, especially if you are used to waiting for crosswalk signals, but you'll get the hang of it after a day or two. Another important thing to remember is to not listen to anyone who says you can take a picture of them for free. They will want you to buy what they are selling and will badger you until you do. This happened to us. When the lady would not leave us alone, we tried to walk away. Suddenly, another woman walked up and blocked our path. She wanted to sell us things too. They kept moving in our way, not allowing us to leave. Honestly, I would have pushed past them if I was in America. But in a foreign country, especially one with a contentious history with us, I didn't feel like that would be a good idea. So, just keep walking. Our first hotel actually had a lot of great tips. I would encourage you to check them out. Hanoi was Jackie's and my favorite city in Vietnam. We decided to spend more time there as opposed to Saigon because of the culture and smaller town aspect. We were not disappointed. The architecture is beautiful and the people were consistently kind and helpful. Our classy first room at the Little Hanoi Diamond Hotel. [Recommended] Little Hanoi Diamond Hotel. I loved it here. Their rooms are a good size and the location is perfect. We could walk around and see many sights easily. It made a great base to drop things off at before heading out again. They have a nice little juice bar on the first floor as well. If you get one of the top floors, you get a nice view of the Old Quarter. The man at the front desk helped us nearly everyday. He pointed us in the right direction, suggested restaurants and sights to see, places to relax, booked a Ha Long Bay tour for us, and always had a smile on his face. We paid $22 a night (including breakfast) with $15 for the taxi to the airport. The shuttle from the airport was free. The beer in the mini fridge was about $1. The breakfast is not large at all, but it is decent and enough to start you off. [Hugely Recommended] Ha Long Bay Junk Boat Tour: Book it at your hotel, stay overnight, and try kayaking. [Hugely Recommended] Hidden Hanoi Cooking Class: Spend some time learning how to cook Vietnamese food! They give you all the supplies and walk you through it. Plus, you get the recipe, pointers, and a meal you just cooked at the end. [Recommended] St. Joseph's Cathedral (Nhà thờ Lớn Hà Nội, Nhà thờ Chính tòa Thánh Giuse): A gothic-style church that seems to come out of nowhere, it is weathered but classic. Be respectful of the masses that may be going on inside. Feel free to photograph the outside as much as you like though. [Recommended] Trấn Quốc Pagoda: Very unique pagoda, check out the offerings of beer and fruit, observe people praying (of course, be respectful, they aren't zoo exhibits). [Decent] Lenin Park: You might just pass through this small, nice park. Kids skateboard a great deal around the statue of Vladimir Lenin. Pretty cool to see. [Decent] Flag Tower of Hanoi: Again, you might just pass by. It looks interesting, so you can stop and take pictures for a few minutes before moving on. Yum! You drink that drink, +Jackie! [Recommended] City View Cafe: Great views, cheap beer. We didn't order any food here though because we weren't hungry while we were there. [Recommended] Legend Beer: Located in the same building as City View Cafe, great views, cheap food (mostly local seafood) and beer. [Recommended] Quán Ăn Ngon: Great Vietnamese food, everything is well priced, very tasty, comes with high recommendations from basically everyone, watch out for them giving you beer with ice (it is apparently a thing to do in Hanoi, but it waters it down). I loved the spring rolls. [Recommended] Gecko: Happy hour is super, super, super cheap, and there is a great, relaxed atmosphere. [Recommended] The Gourmet Corner: Amazing view of the city, outdoor seating area is perfect for a romantic date, unique drinks, good food, average prices. Looking at Jackie as we leave our room at the Sea Star Resort. 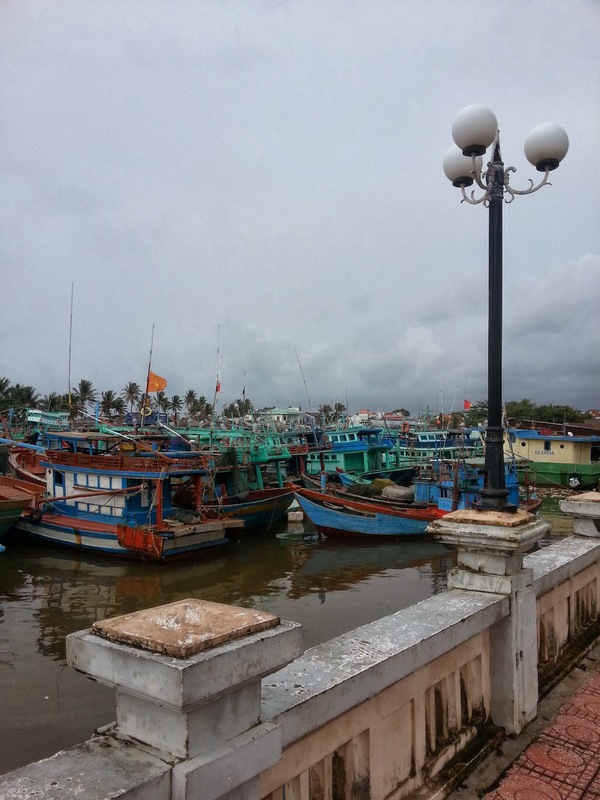 After all the adventures in Hanoi, Phu Quoc was a great change of pace. We went during the off season in the summer. That meant it was basically empty all over the island. We had long stretches of beach to ourselves or only shared with a couple people. However, it rained like crazy about half the time. Despite the rain, it was fun. (And it is kind of romantic to run together in the pouring rain just to get back to your room). The location is nice on the beach, but it is a little bit of a walk down an empty road to get to the town. It's worth it, though, because the beach was basically empty. I would say it would be dangerous at night, but there was never a time I felt like anything bad would happen. Our room was large and had a gigantic shower. We had a couple of cute lizards come in from time to time. That might sound gross, but they just popped in and out every once in awhile. A couple of nice dogs also hung out on the beach. The resort workers were helpful, personable, and easy to deal with. It was easy to book our tour of the island, and we were able to book a cheap massage on the beach with only 30 minutes notice. We paid $51 a night. That included breakfast, airport transfer, and taxes. We stayed in the sea view bungalow (It wasn't exactly "sea view." It was one row of bungalows away from the sea. A 30 second walk away.) Soda and beer in the mini-fridge were about $1. And the restaurant at the resort sells tasty food for good prices. The breakfast is surprisingly large with really good coffee. [Recommended] Coconut Tree Prison: It's a rough sight, lots of terrible images of torture and war crimes. Probably not good for young children or Americans who are hyper-sensitive against anyone saying a negative thing. about the U.S.A.
[Recommended] Beaches/Relaxing: The beaches are wonderful. Just sit there and relax. Get a massage on the beach if you are able to. It is worth it. 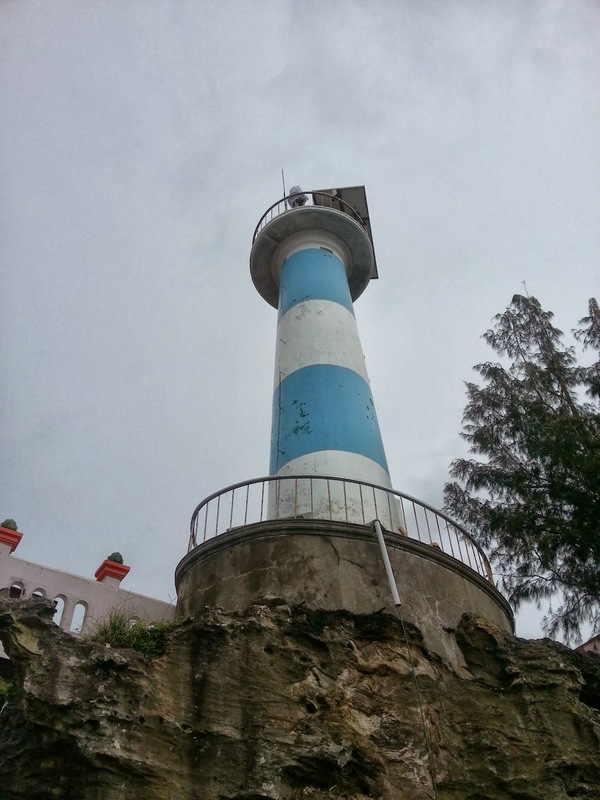 [Recommended] Cau Temple: A beautiful temple connected to a lighthouse. You can climb on the nearby rocks to get a great picture of the ocean. [Decent] Dinh Cau Night Market: It has a lot of local things and food, but also a lot of cheap junk I would rather not tote back home. Some of the mixed drinks at Moe's Bar in Phu Quoc. [Hugely Recommended] Moe's Bar: My favorite bar in Vietnam. They gave us the best service. All of the workers treated us like friends. The drinks are cheap and there are many different choices. The bar is covered, but the one side is open. It's cool because you can watch the rain come down while not getting wet. Just great all around. [Recommended] Pepper's Pizza & Grill: Choose your own toppings. Normal pizza prices. I miss affordable, tasty pizza in Seoul... This really hit the spot. [Recommended] Ganesh Indian Restaurant: I didn't see many Indian restaurants on the island, but this one was good. The portions are generous. The atmosphere is nice as well. A good date night place. [Recommended] Sea Star Restaurant: This is the restaurant at the Sea Star Resort. We stayed at the resort, so we ate here all the time. Breakfast is very tasty and has many options. Lunch and dinner have many seafood options. It does not cost much at all. The best part is the view. It is located right on the beach. You can sit outside as well. [Decent] Sông Xanh Restaurant: Want boar or venison? This is your place. It is very crowded and we were lucky to get a seat. Because there are so many people eating there, it is loud. There is a reason why it is so crowded though, the food is good. It was a little out of the way for me, distance-wise, but if you are nearby, you might want to check it out. Tourists looking at the basilica. We live in a huge city, Seoul, so we were less interested in staying long in an urban area. There are many things to see in Saigon, but I have absolutely no regrets in spending all my time in Hanoi and Phu Quoc. If we go back to Vietnam, we will probably skip Saigon all together. It isn't bad, but Hanoi is simply more charming. [Not Recommended] Thành Long Tân Hotel: This is the only place that I did not research before going. It was a last minute booking and it ended up being the worst place we stayed at. Luckily, it was in a great area and did not cost much. The worst part was when we got there, the service was lacking. People were not particularly nice, and the bellhop lingered around looking for a tip. He was the first person who looked for a tip in the eight days we had been there. I also saw a cockroach. Overall, it wasn't the worst place, but it was the worst we stayed at in Vietnam. I'm sure you could find somewhere better to stay. 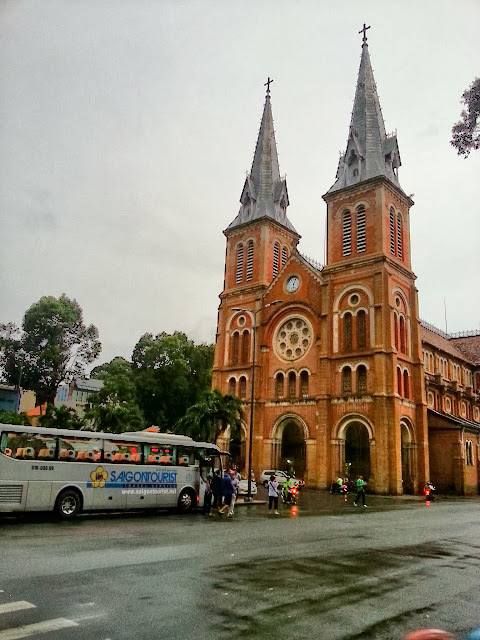 [Recommended] Saigon Notre-Dame Basilica: A strikingly beautiful cathedral in the middle of the city. Gothic style. Many people stood outside and took pictures while we were there. [Recommended] Saigon Central Post Office: Another beautiful building directly across the street from the basilica. Designed by Gustave Eiffel, creater of the Eiffel Tower and Statue of Liberty. It is still up and running. You can buy little books and postcards there. I found a Hanoi cookbook for Jackie. She mailed postcards for a pretty decent price. [Recommended] Molinari Café: Very classy place. A good place for conversation over coffee and cake. Comfortable chairs. They have Bailey's and coffee drinks as well! [Not Recommended] Vuvuzela Beer Club: Too expensive for the quality of food. By far, by far, the worst service I received in Vietnam. The servers messed up our order, forgetting to bring us a whole meal, and still charged us for it. Took forever to sort out the mistakes. They have a good selection of beer, but it is not cheap at all. Basically, this is a Hooters. If you like Hooters, you might like this. I do not like Hooters. And there you go! Hope this helps any future travelers to Vietnam. We had a great time; it was the best vacation we've been on yet. Good luck on your adventures in Vietnam!